It is exactly three and a half years since our daughter Madeleine was so cruelly taken from us. Three and a half years without her seeing her brother, her sister, her Mummy, her Daddy or her best friends. We are still searching for her. Our small team continues to review all available information, even though we STILL don’t have access to ALL of the information that the UK and Portuguese authorities have. Our team has interviewed hundreds of witnesses, received over 1000 calls, dealt with over 15,000 emails and maintained a computerised database of all information they have received. Despite the difficulties resulting from lack of official assistance, they ‘follow up’ all new leads to try and get fresh information into the investigation. It is incredible to think that for the last two years and three months NO police force has proactively been doing anything to help us find Madeleine. Crucially, there has been NO formal review of the material held by the police authorities - which is routine practice in most countries, and especially when a key piece of the ‘jigsaw’ may have been overlooked. We have tried in vain to get the authorities to play their part but our requests have seemingly fallen on deaf ears. It is simply not acceptable that they have, to all intents and purposes, given up on Madeleine. We need the authorities to do more. We need your support to continue to lobby the British and Portuguese Governments to undertake a joint or independent review of Madeleine’s case. How can you do this? Simply visit: http://www.ipetitions.com/petition/made ... se_review/ today and sign the petition to call on the UK and Portuguese authorities to conduct an independent and transparent review of all information in relation to the disappearance of Madeleine. And in turn, please spread the word and encourage as many others to do the same. Together we can, and will pull all of the loose ends of Madeleine’s case together and find her. Thank you. Looking for our daughter is not without significant cost. 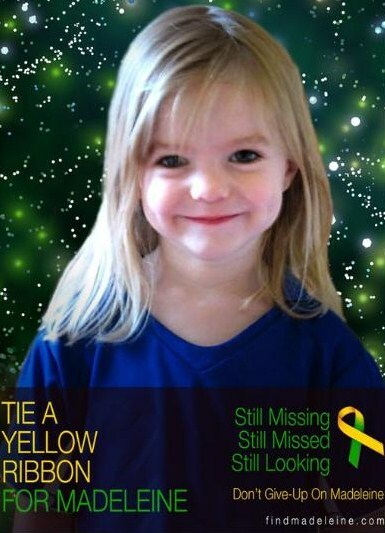 Another way you can show your support is by continuing to help us fund the search for Madeleine. * Our investigation team of ex-police officers to operate and conduct enquiries in the UK, Portugal and further afield. * Media liaison in Portugal and the UK to ensure that we convey the simple factual messages: there is absolutely no evidence that Madeleine has been physically harmed; we must keep looking for her and those who took her. * Awareness campaigns in Portugal, Spain and further afield. If Madeleine's Fund remains as it is, with the current rate of expenditure, it will run out in Spring 2011. This would essentially mean that any kind of proactive search for Madeleine would cease. So again we need your help. If you can, please consider donating to Madeleine's fund. * £10 pays for 1000 posters that are translated and distributed across the world. Someone knows what has happened to Madeleine. We simply need to reach that person. We need to obtain that key piece of information, that ‘missing piece of the jigsaw’. One call may be all we need to find Madeleine and who took her. Our little girl is now seven years old; innocent, vulnerable and waiting to be found. Please, please sign the petition and help us to find her. On behalf of my family, thank you.